If you’re looking for the best deck builders in Canberra, you’ve landed on the right page. Here at Sharpest Constructions, we’ve constructed decks for hundreds of happy clients. We’re proud to say that we’ve developed a reputation for outstanding workmanship, excellent customer service and old-fashioned values, like honesty, punctuality and reliability. 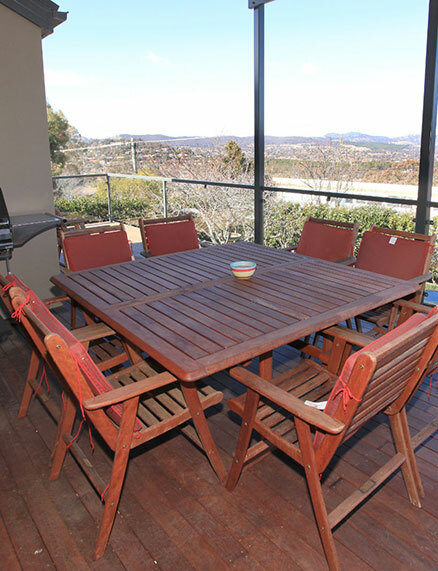 Whatever your budget or style preferences, we can build decks in Canberra to suit your home. The first step in building a beautiful deck is choosing the right timber. No two clients are the same and neither are their tastes. For that reason, we offer a variety of types of wood – from hardwoods to pine. Or perhaps you’re thinking of composite decking? It is made from plastic composite and is available in a variety of colours, letting you choose just the right shade for your home. Composite decking is popular in Australia because it can handle our tough, changeable climate without any trouble. Plus, it is really low maintenance. Composite decking is ideal for decks in Canberra for those who like a hassle-free lifestyle. You get all the benefits of a deck but without the hard work. Once you have decided on which timber you like best, the second step is to settle on style. Of course, what you decide on will depend on your home, how you are planning on using your deck in Canberra and your tastes. There are so many decisions to make! Should you need some inspiration or someone to bounce some ideas off, please give us a call. We are always up for a chat. It is also worth considering whether or not you would like any extras. For example, you might think about adding a ramp, to allow disabled access. There are numerous reasons people decide to build decks in Canberra. For some homes, a deck can be the perfect way to put the finishing touch on a renovation or extension. For others, it is a place to relax in private, with a book, a glass of wine or a good friend. Then there are the social butterflies, who intend on doing loads of outdoor entertaining. Whatever the case, Sharpest Constructions can provide you with the best deck builders in Canberra. If you need some advice or are looking for an obligation-free quote, get in touch with us today.